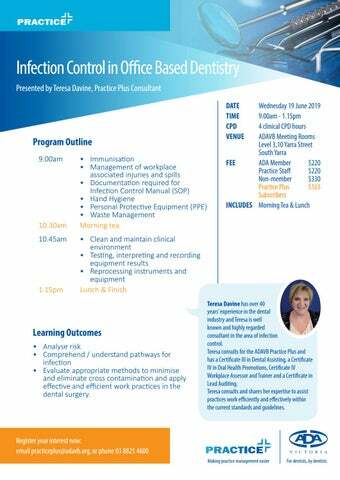 Learning Outcomes •	Analyse risk •	Comprehend / understand pathways for infection •	Evaluate appropriate methods to minimise and eliminate cross contamination and apply effective and efficient work practices in the dental surgery. Teresa Davine has over 40 years’ experience in the dental industry and Teresa is well known and highly regarded consultant in the area of infection control. Teresa consults for the ADAVB Practice Plus and has a Certificate III in Dental Assisting, a Certificate IV in Oral Health Promotions, Certificate IV Workplace Assessor and Trainer and a Certificate in Lead Auditing. Teresa consults and shares her expertise to assist practices work efficiently and effectively within the current standards and guidelines. If there are additional registrants please provide a seperate A4 sheet with their details and dietary requirements. 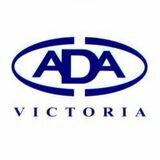 PLEASE NOTE: Your registration for these events indicates acceptance of ADAVB’s Terms and Conditions and Cancellation Policy. Make a copy of this registration form and maintain it for your records.